Electric and hybrid vehicles accounted for more than half of Norway’s new car market during 2017, while petrol and diesel volumes were outpaced by plug-ins for the first time. Figures from Norwegian road interest group Opplysningsrådet for Veitrafikken (OFV) showed the market for new cars was at its highest level since 1986, with 158,650 units registered. Hybrid, electric and hydrogen fuel cell models took a 52.2% share of that – 82,816 cars, up 33.2% on 2016. Demand for vehicles with only a combustion engine is declining; diesel-only cars took a 23.1% share in 2017, while petrols accounted for 24.7%, compared to 30.8% and 29.0% respectively in 2016. The OFV pointed out that diesel had a 64% share of the passenger car market in 2012, reflecting a rapid change in customer demand. Plug-in vehicles accounted for 39.2% of the total market in 2017 and over half of those (53.0%, 33,025 units) were fully electric models – that’s almost unchanged, despite what had looked like an ongoing trend towards plug-in hybrids. Conventional hybrids (non plug-ins) are a smaller part of the Norwegian car market; 20,500 units, or 12.9% of the total, while 55 hydrogen fuel cell cars were registered last year. The OFV added that 52.3% of new passenger cars were company-registered, up from 48.0% in 2017, and that this had been driven by the growth of private leasing. Meanwhile, average CO2 emissions for passenger cars had fallen 11g/km year on year, to 82g/km. 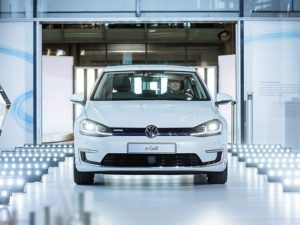 Norway’s most popular new cars are the Volkswagen Golf, BMW i3, Toyota RAV4 and Tesla Model X.